Manchester City are flying high in the Premier League but had a stumble at Etihad against Olympic Lyon to begin their Champions League venture. 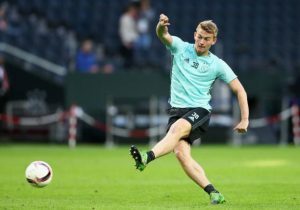 They, however, clinched a victory on the road against TSG 1899 Hoffenheim but are expecting a tougher contest at Metalist Stadium against Ukranian heavyweights FC Shakhtar Donetsk on Tuesday night. These two sides met each other last season as well in group league fixtures where Shakhtar won the home tie 2-1. City were victorious at Etihad but the Miners hold sheer dominance at their own backyard against English sides (W5 D2) in their European history. Pep Guardiola, the charismatic City gaffer has ample quality in the squad and rotated his resources frequently to avoid stress and tiredness. Yet they have a few injury concerns ahead of the tie with midfield general Ilkay Gundogan continuing to be sidelined after suffering a hamstring pull against Hoffenheim. Danilo is ruled out with an ankle injury whereas custodian Claudio Bravo remains the only long-term absentee with an Achilles tendon injury. Kyle Walker, meanwhile, had a minor concern but likely to return to action for the midweek encounter. Pep has not experimented much with team setup this term and preferred a 4-3-3 that suits his tactics and playing style. 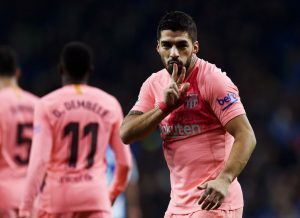 The Spaniard, however, has the luxury of rotating his players almost in every slot and it is to be seen now who are the personnel he lines up for this crucial tie. The Citizens have exhibited a defensive resilience in the league having conceded only three times in nine games. But they have to replicate a similar show in Europe with Ederson in goal as well as John Stones and Aymeric Laporte as the central defensive pair. Kyle Walker is likely to reclaim his right-back role whereas Benjamin Mendy should be operating from the other end. 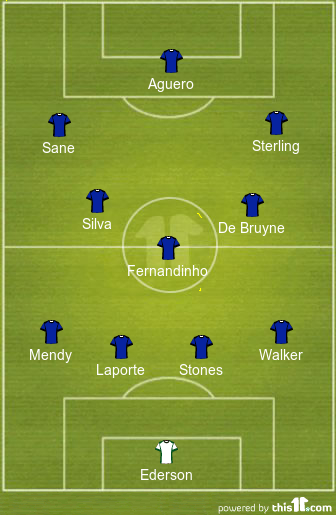 Stones will be deployed as a right fullback whereas veteran Vincent Kompany should be slotted in a central role similar to the Burnley tie if Walker fails to recover on time. Nicolas Otamendi has not been utilized enough so far but should be prepared if recalled in action against their midweek counterparts. Fernandinho continues to impress in a deep-lying midfield role where he is breaking down opponents’ moves to win back possession. He is also building the game up from the deep as the presence of David Silva has allowed him space to make forward runs time and again. Silva has been incredible in a box-to-box role and the return of Kevin De Bruyne should hand him more space and time to deliver defence-splitting through balls. Sergio Aguero, the Argentine frontman, is likely to make his 50th Champions League appearance in Man City colours whereas Raheem Sterling might be recalled in action in place of Riyad Mahrez down the right flank. Leroy Sane has been instrumental down the left in recent games and is expected to keep hold of his place for consecutive games. The 4-2-3-1 Arsenal Lineup That Will Brush Aside Ludogorets: Sanchez To Start Up Front? 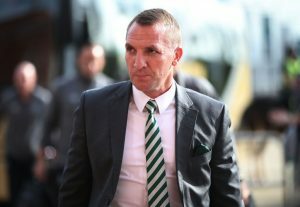 Predicted 3-5-2 Celtic Lineup Vs Rosenborg For Champions League Qualifier: Edouard To Lead The Line? 4-3-3 Real Madrid Predicted Lineup To Face Borussia Dortmund: Zidane’s First Victory Over BVB?